Recent health care payment reforms aim to improve the alignment of Medicare payment strategies with goals to improve the quality of care provided, patient experiences with health care, and health outcomes, while also controlling costs. These efforts move Medicare away from the volume-based payment of traditional fee-for-service models and toward value-based purchasing, in which cost control is an explicit goal in addition to clinical and quality goals. Specific payment strategies include pay-for-performance and other quality incentive programs that tie financial rewards and sanctions to the quality and efficiency of care provided and accountable care organizations in which health care providers are held accountable for both the quality and cost of the care they deliver. Accounting For Social Risk Factors in Medicare Payment: Criteria, Factors, and Methods is the third in a series of five brief reports that aim to inform ASPE analyses that account for social risk factors in Medicare payment programs mandated through the IMPACT Act. 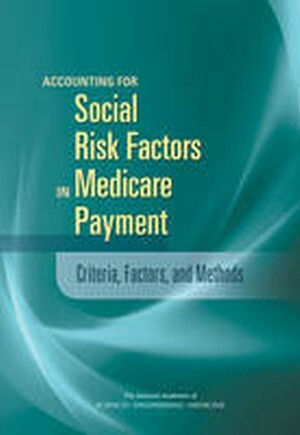 This report builds on the conceptual relationships and empirical associations between social risk factors and performance indicators used in value-based payment identified in the first report to provide guidance on which factors could be considered for Medicare accounting purposes, criteria to identify these factors, and methods to do so in ways that can improve care and promote greater health equity for socially at-risk patients.